Preheat oven to 350°F. Grease a muffin tin with butter. In the bowl of a stand mixer fixed with the paddle attachment, mix together flours, sugar, salt, baking powder and soda, cinnamon and nutmeg. Add buttermilk, eggs, butter, vanilla, apples, carrots, flax seeds and granola. Mix thoroughly. Spoon mixture into muffin tins, filling 3/4 of the way. Bake about 40 minutes until a toothpick inserted in the center comes out clean. This is the second in a three-part series this week on apples, following Sarah Caron's post Wednesday on Homemade Applesauce. Hello, fall. Hello, apple-picking season. Hello, most wonderful time of the year. I know most would say Christmas is the most wonderful time of the year (or at least that's what Andy Williams sang), but for me, it's fall, right when the leaves are changing; the air has an aroma of cinnamon and nutmeg and that slight bite of a chill; and apples and pumpkins are ready for picking. I absolutely love going to an orchard and picking my own apples right from the tree. It often becomes an obsession -- rarely do I leave my annual orchard trip without having purchased bagfuls of freshly-plucked apples, several tins of homemade apple pie and a box of my favorite item: Apple cider doughnuts. If this kind of apple overload is so wrong, I don't want to be right. One of my favorite things to do with my bagfuls of orchard apples is bake with them. 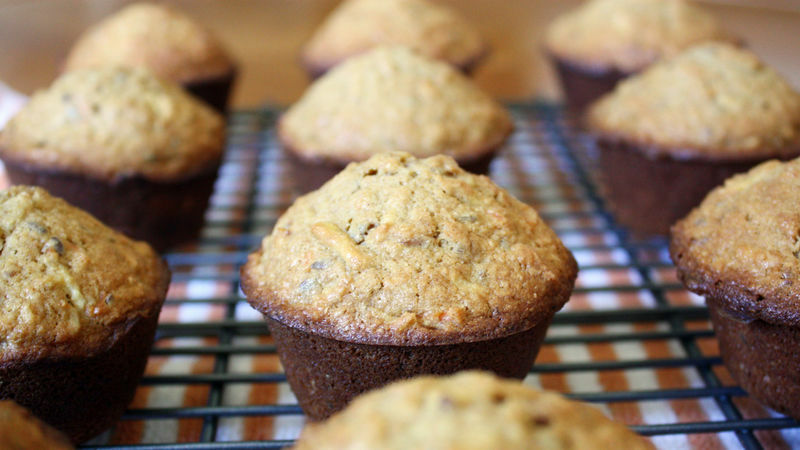 And one of my favorite recipes with which to use these apples is Loaded Apple Muffins. Really, they're more like a fancy bran muffin. Or a carrot and raisin muffin with apples. Or a granola muffin with apples and carrots. However you perceive them, their taste is undeniably amazing, like all the flavors of fall in one magical muffin. Though each muffin packs a serious wallop of healthy flavor with grated apples and carrots, raisins, honey, oats, cinnamon and nutmeg, I'm not going to lie to you -- there's also a serious wallop of butter and brown sugar added to the list (though my husband still deems them healthy). They may not be as good for you as they seem, but in small muffin-size portions, they do offer a decent helping of nutrition amid the sweetness of butter and sugar. Plus, after a long, arduous day of roaming orchards and picking apples, don't you think you deserve a tasty, apple-filled treat? I think you do.